Among the delegates at this year’s Australia India Youth Dialogue was Asialink Business manager of partnerships and development Natalie Cope. Read Natalie’s report on outcomes from the successful dialogue, held in India and attended by high calibre speakers and delegates from Australia and India. “The truth is, Australia and India don’t really know each other”. With his comments Amit Dasgupta, long serving career Diplomat, author and former Indian Consul General to Sydney provided a powerful and sobering introduction to the 2016 Australia-India Youth Dialogue. India is currently Australia’s 12th largest trading partner, and our seventh biggest export market. The number of Indian-Australians has almost tripled from 130,000 to 400,000 in the past decade. We share a colonial past, and a common language. We both embrace democracy and face similar geo-political and traditional and non-traditional security concerns. Yet despite what seems a stage set for a deep, engaged and fruitful partnership, the India-Australia relationship over recent decades has suffered what Mr Amit refers to as a benign neglect. With the gulf of time, misperception has replaced deep understanding. India has, in the minds of many Australians, become a place too hard to do business. While Australia, with a population of a mere 24 million, is considered by many in India as a market too small to warrant serious attention. Deeper economic, strategic and cultural engagement is needed to combat these misperceptions and provide significant mutual gains for both countries. India’s workforce, for example, grows by roughly the size of the Australian population each year. By 2020, it will become the world’s youngest country. As a major education exporter and leader in the VET and skills space, Australia has the opportunity to help India reach its urgent target of a trained workforce of 500 million people in the next 10 years. In a speech at the Dialogue, Asialink Business CEO Mukund Narayanamurti said that closer engagement will help to build on the clear synergies that exist between the two countries. For India, Australia is a market fit for securing price realisation and safely gaining validation for product concepts. Australian businesses can likewise recoup costs through scale in India’s huge market. The annual Australia-India Youth Dialogue (AIYD) provides a youth-led initiative for exploring these synergies. Now in its fifth year, the AIYD brings together 15 young Australian leaders and 15 young Indian leaders in the fields of business, arts, academia, diplomacy, government, science and sport, amongst others, to discuss opportunities and challenges significant to the Australia-India relationship. 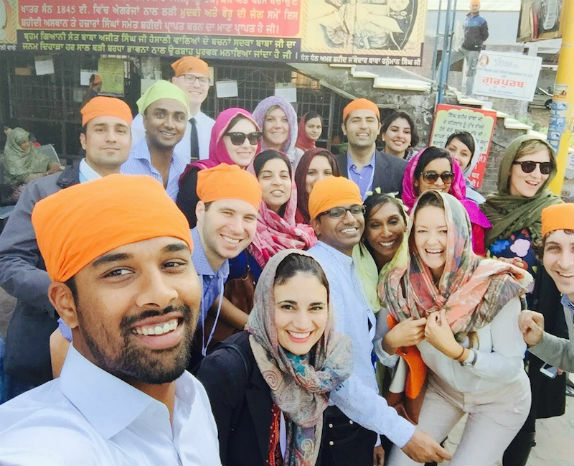 In January 2016 the AIYD travelled to India, where delegates heard from experts including Australia’s Acting High Commissioner to India Chris Elstoft, Asialink Business CEO, Mukund Narayanamurti, Ola Cabs Head of New Initiatives, Sundeep Sahni, and Founder of the Kumaon Literary Festival Sumant Batra. Discussions across the four-day dialogue revolved around cultural identity, sustainability and innovation, and included a session where groups pitched practical ideas for advancing Australia-India cooperation to a panel of judges. But perhaps the most important aspect of the AIYD was the opportunity for delegates to develop meaningful relationships with each other and address some of the misperceptions that may hinder the bilateral relationship. Delegates to this year’s dialogue included a young Australian leading an electronic health record system taking storm in India; a young Indian woman connecting high-performing Australians with social-enterprises across India; senior representatives leading bi-lateral arts and cultural engagement initiatives; sitting politicians from both India and Australia; media personalities and commentators from both countries, and leaders of both Australian and Indian skills and training organisations. Like its sister initiatives the Australia-China Youth Dialogue, the Conference of Australian and Indonesian Youth (CAUSINDY), the AIYD is a tremendously important contributor to soft diplomacy in the bilateral relationship. Asialink and Asialink Business remain long-term supporters of these youth initiatives, whose delegates are future leaders in critical Australia-Asia engagement. Natalie Cope represented Australia as a delegate at the 2016 Australia-India Youth Dialogue. She works at Asialink Business as Manager of Partnerships and Development, as well as being a non-executive director of the Australia-China Youth Dialogue. Natalie is the Ambassador to the Westpac BiCentennial Foundation’s Asian Exchange program and in 2015, Natalie was the named Australia’s Top Emerging Leader and MBA Scholar by AFR BOSS and Sydney University, receiving the Emerging Leaders MBA Scholarship by the University of Sydney Business School.